As we ended our previous article, I had removed the engine and engine compartment framework from my 1967 Jaguar E-Type 2+2 as part of a general refurbishment. This month we will begin to talk about paint and bodywork. Modern automotive paints are all generally urethane based. I don’t know much about the science of paint but urethane paints seem to be the current state of the art as far as being bullet proof, resistant to the effects of the suns rays, and beautiful to look at. To some degree, I feel that picking a paint manufacturer is somewhat akin to the Ford versus Chevy debate. I have hitched my wagon to Dupont products mainly because they have a dedicated store in Raleigh where I can get some free advice along with my purchases. An important point is to pick a paint supplier and stick with their product from start to finish. Don’t mix and match between suppliers. Today’s automotive paints represent a paint system and the correct sequence of products needs to be adhered to. Generally speaking, starting with bare metal, you will apply a primer, a filler, a sealer, a color coat, and a clear coat. In some cases, the color coat and clear coat may be combined into a single stage product. The job of the primer is to provide a tenacious bond to the bare metal. Epoxy based primers seem to be in vogue at this time. For a really nice job, you would follow the primer coat with a high build filler. The filler paint goes on rather thick and can be easily sanded. The filler allows the surface of the body panel to be sanded to a uniform, defect free condition. The sanding part is the area where much of the labor goes into a paint job and is an area where the hobbyist can make a real contribution. The sealer coat is next. I am not quite sure of the function of a sealer but apparently it really locks in the paint system applied to that point and presents a solid base for the color coat. I believe it is also a key element to the resistance of the paint to the sun’s ultraviolet rays. Apparently, UV rays are what kills paint jobs over the long run. The color coat is just that, the final color that you will see. It is also called the basecoat. Before applying a clear coat, the base coat will have a dull or matte finish. The final coat is the clear coat. The clear coat is just that, clear. On a typical factory and repair shop job, the clear coat is put on to the paint manufacturer’s minimum thickness standards and when it dries, that’s it, the job is done. In most cases one gets a reasonably acceptable paint job, especially if the painter (or painting robot) can apply the paint without runs and no dust particles land in the still wet paint. But this is an area where the hobbyist can go the extra mile and obtain an outstanding paint job. The clear coat can be applied thicker than the minimum requirements and can then be “color sanded” to a mirror finish. I find the term color sanding to be mis-leading, as what you are really doing is sanding the clear coat with very fine grit sandpapers and rubbing compounds. The goal is to bring the top surface of the clear coat paint, at a microscopic level, to an absolutely flat surface. This surface reflects all available light back to one’s eye, such that you get that dazzling show car finish. I learned a lot of the technical aspects of painting at the Forum discussion group at www.autobodystore.com. The paint supplier websites are also useful, with Sherwin-Williams having a particularly educational site. I can only scratch the surface here but this is one area where there are lots of resources available, since painting is required for all car restorers. Generally speaking, on a 40 year old car like the E-Type, you will want to remove all of the old paint. Since the paint is a system, application of new paint over unknown 40 year old products is a recipe for disaster. Removal of old paint is a nasty job, with several options available depending on the relative value of your time and money. The no-sweat option is to have the car professionally stripped. This could involve media blasting or chemical dips, or a combination. The one bad rap I hear about chemical dips is that the chemicals tend to get into the seams and then weep out later, disrupting the paint job. Media blasting encompasses an abrasive blast of sand, glass beads, and even baking soda. Each have their merits but I would certainly only entrust this job to a vendor with experience and good references. Done right, these avenues will leave you will a clean body shell with all its pimples and warts exposed. One thing to consider is that immediately upon cleaning the body shell to bare metal, rust will commence. One solution is to get the body shell into epoxy primer as soon as possible. A recent article I read recommends two coats of epoxy initially. Any plastic filler work is then applied. The entire car then receives a final coat of epoxy prior to proceeding to the sealer coat. Another solution is to treat a shell that has picked up minor surface rust with a metal conditioner, which is generally a phosphate based solution that converts the minimal build up of rust to a benign form. These conditioners are offered by all the paint manufactures and are discussed on their websites. The metal conditioner is followed immediately by epoxy primer. What I like to do is perform my own paint removal over a weekend and finish up with a coat of epoxy primer on each area as I go. 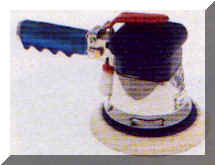 The old paint can be removed from large relatively flat areas using a rotary grinder with coarse grit sandpaper disks. Another tool that works pretty well and gets into to tighter or curved areas is what I call a “nylock” disk, which looks like a circular piece of coral mounted on a 1/4″ diameter spindle. Spring for the ones from 3M or Norton that are hard mounted on the spindle. I bought some cheaper ones at Lowes that came with the spindle being separately mounted. It’s virtually impossible to get the wheel centered on the spindle and mine vibrated badly and then flew into pieces. Now let’s be honest. You wouldn’t be involved in this hobby if you didn’t want to collect some tools. If you are going to do body work, it’s really time to step up and buy an air compressor. I went cheap on my first one several years back and bought one that was too small. 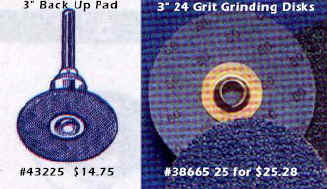 Sure, it would run hand tools like a die grinder or a rotary sander. But the acid test is does it have enough air flow to blast sand. Because, before you’re done, being able to blast some sand with a cheap siphon sand blaster is invaluable as a means to get at paint and crud in tight places where sandpaper and disks won’t reach. 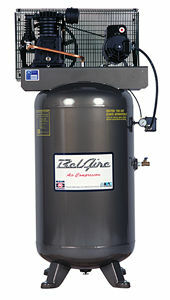 I recently purchased a compressor made right here in the USA in Rock Hill, SC under the Bel Aire brand. It has a two stage compressor and is about the biggest you can run on a 220 Volt, 30 amp circuit. It provides plenty of air. By the way, research the product you want and then Google the description on the internet. It is amazing the range of prices offered for the exact same product. This works for all sorts of things. I wound up buying my compressor over the internet from a firm in New Jersey, which had the compressor dropped shipped to me from Rock Hill via truck, with free shipping. It’s the reverse of E-Bay. You keep looking until you find the lowest price! I used a combination of sanding disks and the sand blaster to remove the existing paint from my engine compartment sub-frames. Although they had appeared to be in acceptable condition prior to removing the paint, with the paint gone, corrosion was evident in the form of small holes. 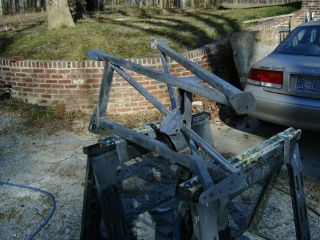 Next month, I will discuss how I repaired the sub-frames and got them ready for painting.